Drive south on Highway 99, exit on the Herndon Avenue exit and travel east, through Fresno to Clovis. 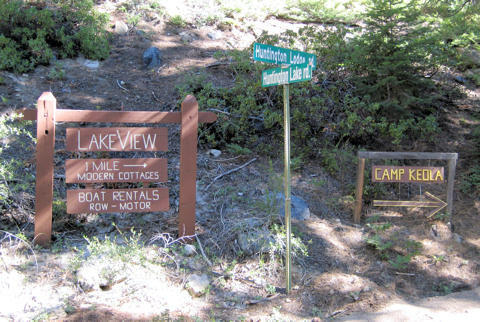 Take Freeway 168 east and follow the signs to Huntington Lake. Drive north on Highway 99, exit at Freeway 41 North, take the Freeway 180 East exit and then immediately take the Freeway 168 East exit to Clovis. Continue on 168 through Clovis and follow the signs to Huntington Lake. Follow Highway 168 around the lake. It seems like a long way around…it is about 5 miles. You will pass Huntington Lake Resort. After passing a dam on your left, you will head down the hill and think you are leaving the lake (but you're not!). There will be a fork in the road and a sign to Camp Keola (in summer only) and a street sign. Take the Huntington Lodge Road back up the hill to the lake. 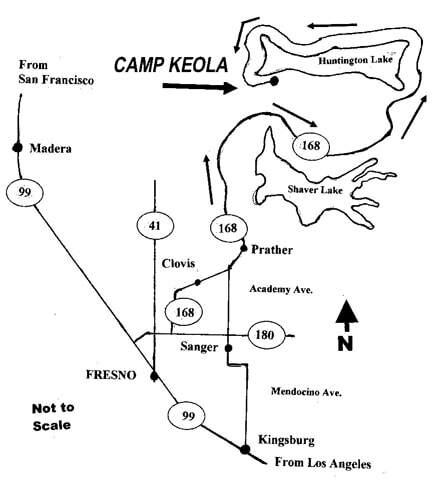 When you see the lake, there will be a street sign indicating Camp Keola Lane. Take the right turn and stay to the right. Follow the narrow road up the hill until you get to the entrance. At the parking area there is a gate to keep cars from driving onto the grounds. Lower Parking Lot: If the main parking lot is full, there is additional parking in the lower lot. Continue on Huntington Lodge Road past the entrance to Lakeview Cottages. There is a dirt road that takes off to the right. Follow the road to Camp Keola lower parking lot. Walk up the hill on the service road to the camp. If you need more information or to check on travel instructions, please email info@campkeola.org.